In New Zealand, protection and control IED products from Siemens are distributed by HV Power. These products not only include the SIPROTEC brand of numerical protection relays, but also the REYROLLE brand of relays and test blocks. Siemens is one of the world’s leading suppliers of protection equipment for power systems. SIPROTEC relays support a broad range of communication protocols, such as; IEC 60870-5-103, DNP3, MODBUS, PROFIBUS … and the international standard IEC 61850. For discrete auxiliary relays, arc fault monitoring and pilot wire supervision products, we recommend RMS. Siemens SIPROTEC 5 series of protection relays provides outstanding features and capability with their new generation of technology. The SIPROTEC 5 range supports the needs of advanced transmission applications, answers the call for powerful security and flexible communications capabilities. SIPROTEC 5 many new features such as support for DNP-iP and Arc Flash Detection make this range well suited to distribution applications. SIPROTEC 5 is characterised by modular, field expandable hardware. The release of SIPROTEC 5 does not affect SIPROTEC 4, which continues to be fully supported. SIPROTEC 4 is still the product for many of our customer’s standard applications. With this new hardware range, you require DIGSI 5, a very powerful piece of software, specifically developed to support the features of SIPROTEC 5. DIGSI 4 continues to be developed and supported for SIPROTEC 4 applications. A variety of Siemens units ranging from overcurrent-time protection for medium-voltage applications, to distance and differential protection for extra-high voltage applications. All units have control functions and offer a variety of communication possibilities. They have a large number of integrated protection functions, from which you can easily select those required for your specific application. Advanced functionality at minimum space. The SIPROTEC Compact relays provide a functionality almost equal to SIPROTEC 4, but in a compact size. High adaptability via pluggable current and voltage terminal blocks, and exchangeable communication modules. A quick data acquisition is available through USB front port. 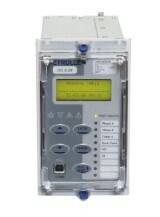 REYROLLE is a brand of Siemens protection relays (Siemens Protection Devices - SPD). Manufactured in the UK, the REYROLLE brand of numeric and auxiliary protection relays offers simple and versatile functionality. The range mainly has support for DNP3, IEC 60870-5-103 and MODBUS RTU. Some products are now available with IEC 61850 protocol. The REYROLLE range includes the products known under names of Solkor, ARGUS, Delta and Duobias. With over 45 years of experience, RMS Mors Smitt offer a broad base of field-proven product standard products with good delivery. Featuring from the simple CT powered “Easy” series, the SIPROTEC Compact Series, to the multifunctional SIPROTEC 7SJ64 Series, and now the new SIPROTEC 5 Series. Options include undervoltage, undercurrent, broken conductor, negative phase sequence, thermal overload, earth fault and sensitive earth fault, CB failure, overvoltage, neutral displacement, high impedance earth fault, directional elements, cold load, CT and VT supervision, trip circuit supervision and lockout. The Argus-M is similar to the Argus-C, but significantly offers a larger I/O count and in addition to DNP support, it also offers an IEC 61850 Ethernet interface option. The SIPROTEC 7SA Series offers advanced features for transmission line distance protection. Solkor R/Rf Electromechanical pilot wire relay for copper pilot wires. Solkor R/Rf relays are well known and proven for their simple, traditional and reliable approach to differential line protection operating over copper pilot wires. Installation is simplified with no need for auxiliary supply circuits. Intertripping and pilot wire supervision products also available, however for these more complex protection requirements, we recommend the Siemens SIPROTEC 7SD80. Numerical relay with support for copper, fibre or digital communication networks. The 7UT Series offers products for two winding to 5 winding transformers. We recommend the SIPROTEC 5 7SS85 series of centralised bus protection (low impedance). High impedance products are also available. SIPROTEC offers protection relays with protection functions specific to the needs of medium and large generators. Arc fault monitoring offers a method of very rapid clearance of faults within metal clad switchgear and associated cable boxes. Sensors detect the optical signature of the onset of an arc fault and a trip signal can be achieved within 10 ms, considerably faster than traditional IDMT overcurrent relays – especially as the onset of an arc fault can occur at relatively low fault currents. Multiple sensors and zones can be configured to trip feeder, bus coupler or incoming breakers as required. Stand alone arc sensors that can be used with virtually any manufacturers protection relay. These products are ideal for retrofit applications. The SIPROTEC 7RW80 is the ideal relay for monitoring frequency and initiating load shedding. Operating over the range of 40 to 60 Hz with four independent stages and contacts are provided. Each stage can be set with independent time delay, under-or-over frequency AND/OR rate-of-change-of-frequency (ROCOF) elements. Under-voltage blocking is possible. Relay status contacts are also provided. DNP 3.0 and IEC 61850 protocols are supported. The RMS 2H34-S is a simple solution for monitoring frequency and initiating load shedding, operating over the range 40 to 60 Hz. Four independent stages and contacts are provided. Each stage can be set with independent time delay, under-or-over frequency AND/OR rate-of-change-of-frequency (ROCOF) elements. Under-voltage blocking, under and over-voltage alarm and relay status contacts alarms are also provided. Simple programming via front panel or RS-232 interface is possible. More info on the range of predefined Auxiliary products available. RMS low-cost trip circuit supervision relays offer a standard approach for detection of trip coil, trip wiring and trip relay problems. These simple to install products offer alarm relay outputs, thus eliminating the need for custom built solutions where multifunction relay I/O is not available. Also available are the Siemens 7PA30 Three phase and single phase trip circuit supervision relays. See the SIPROTEC website for further details. The 2P48 relay is a Voltage Selection Relay for the automatic changeover between two VT supplies. The relay is designed to automatically change over from the primary supply to the secondary supply if any phase of the primary supply has faulted. Each of the incoming phases for both primary and secondary supplies have LED indicators to indicate healthy supplies. The outgoing phases are also indicated. Monitoring for excessive negative sequence voltage resulting from phase failure, phase unbalance and reversed phase sequence is provided. Note the 2P48 is designed for three phase supplies and requires a neutral connection. If this is not available then 2P49 version should be used. The range of 2RMLG test blocks, housed within an Epsilon enclosure, offers facilities for monitoring and secondary injection testing of power system protection schemes in conjunction with the MMLB 01 multi-fingered test plug. Compatible with REYROLLE and Areva test blocks, the RMS 2RMLB Test Plug offers 4 mm finger-safe terminals for normal or shrouded banana plugs.